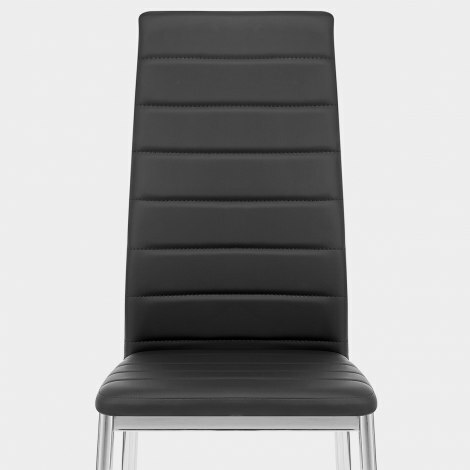 The Francesca Dining Chair Black is a modern classic fit for any dining room or kitchen diner. Accompanying your dining table with a cool sense of elegance and comfort, the Francesca Dining Chair is a fantastic piece of furniture with contemporary chic. Sporting a high, supportive backrest, the Francesca is eye catching with prominent segments that highlight the comfortable, ergonomic seat shape. Black faux leather adds a touch of luxury and class. The seat contrasts with the chrome plated legs below, tapering steel bars that keep it stable. The Francesca is ideal for all surfaces thanks to the integrated floor guards beneath, helping to keep wood and tile floors free from scratches. "Very comfortable, support my back nicely"
Looking for a good value dining chair to support my husband’s back. Incredibly quick delivery and easy to assemble. The chair looks good and has made such a difference to him. Found this webpage on line, ordered the chairs and they arrived next day, not only was it a great service the chairs are very comfortable, great purchase. Brilliant chairs . Just what we were looking for . Really nice chairs. Looked for ages to find something suitable to go with a white glass table and our decor. Perfect. Very pleased with the product;delivered on date/time as arranged;will definitely use Atlantic again.Thank you.